Wednesday January 15th 1879. It was snowing this morning and continued all day. I helped with the work, finished my night dresses and made some carpet rags. Went to bed early. 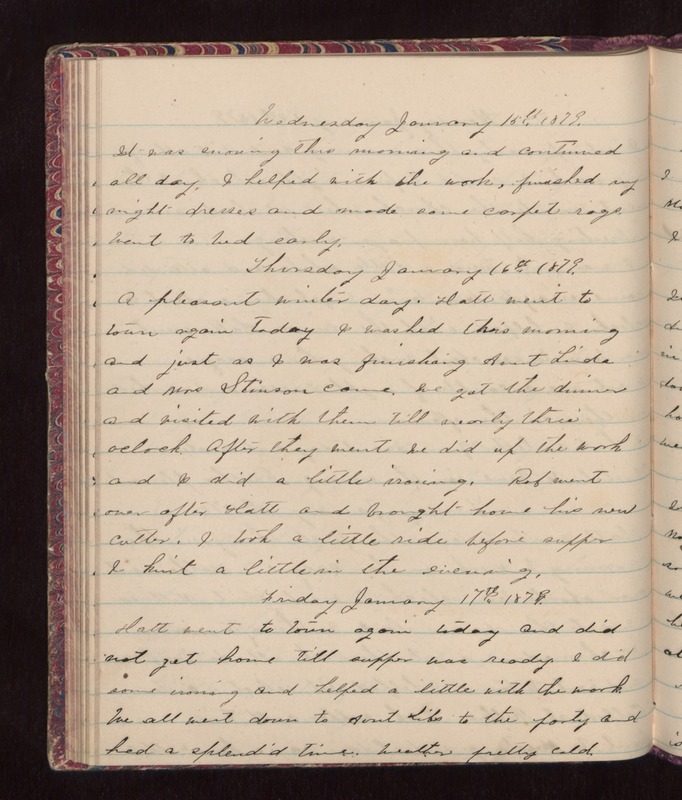 Thursday January 16th 1879 A pleasant winter day. Hatt went to town again today I washed this morning and just as I was finishing Aunt Linda and Mrs Stinson came. We got the dinner and visited with them till nearly three oclock. After they went we did up the work and I did a little ironing. Rob went over after Hatt and brought home his new cutter. I took a little ride before supper I knit a little in the evening. Friday January 17th 1879 Hatt went to town again today and did not get home till supper was ready. I did some ironing and helped a little with the work We all went down to Aunt Libs to the party and had a splendid time. Weather pretty cold.